One of the most affordable fish finders of 2017 is the Striker 4 and one of the best portable fish finder, made by Garmin. It is also one of the most affordable small units around that has CHIRP technology. It's bound to attract many people, so we had to do a full review. The striker 4 comes in two different versions, with different part numbers. One is 010-01550-01 and the other 010-01550-00. Concerning specifications, they are, more or less, the same. The difference is in the documentation that comes along with each device. If the last two numbers are "00", you will get the English Documentation. If the last two digits are "01", then your unit comes with World Wide documentation. 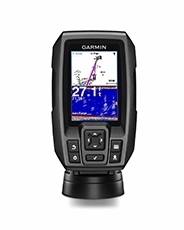 The Striker 4 from Garmin comes equipped from the factory with the 010-10249-20 transducer and uses a 4-pin connector. This transducer is 77/200 kHz capable and uses two cone shaped beams. One 45° beam for 77 kHz, and one 15° beam for 200 kHz. If you need to search through bigger depths, you can use the control unit with a 50/200 kHz transducer. That's because it is capable of 50/77/200 kHz. You should also know that the control unit is capable of only using High and Mid CHIRP. This device will let you scan to a top depth of 750 feet or 228 meters in saltwater. In freshwater, its limited to 1,600 feet or 487 meters. But, this is possible only if you possess a transducer capable of 50 kHz. The transducer that comes out of the box has a top depth of about 800 feet or 244 meters. A powerful CHIRP sonar provides the Garmin Striker 4 with quality images. In other words, a clearer picture means targets that are better defined. It also means a better view of the bottom, as well as less clutter on the screen. Besides that, CHIRP has incredible separation of targets. With CHIRP a firmly packed school of fish won't appear as a single, larger target. This can be a problem with conventional sonar units. This device's 2D sonar offers a lot of useful functions. Among these, there are the A-Scope, UltraScroll, Flasher, Auto Gain, Fish Symbol ID, Split-Zoom, including different alarms. For people who aren't familiar with these functions, here's a quick explanation of some. The Fish Symbol ID function processes the sonar returns in different ways and adds different fish icons to them. Besides that, it shows the depth of each target fish. It's easy to see how useful this can be to every owner of the Striker 4. The Flasher mode is a depth scale in circular form. It also provides information on targets found by the sonar beams. The Flasher's inner rings show depth, and the flashing segments on the outer rings show different sonar returns measured in strength. This function comes in handy when ice fishing or fishing from a stationary position. The A-Scope is also a flasher function. The difference is that it provides information in a vertical layout about the most recent returns from the sonar. The Auto Gain function gives users the chance to let the unit filter out unwanted noise without manual adjustment. With Ultrascroll, you can scan while moving at high speeds. It enables faster scrolling of the sonar data. But, if you're going over 40 Mph, image quality will suffer. There're a couple of things left to mention in this section in regards with the transducer mounts. The Garmin Striker 4 comes with a trolling motor mount as well as a transom one. There's 20 feet or 6 meters of cable in the box. Also, there's a sensor for temperature integrated. The Striker 4, just like many other portable devices in this series, doesn't come with a chart plotter. That's why the GPS system uses a blank sheet for support. But, the Striker 4 has an internal GPS module with high-precision. This module provides the coordinates to your current location with impressive accuracy. It is also used to track the speed of your boat. If you want to mark waypoints, you can do so with this unit. You can use this function to keep track of your favorite spots for fishing. But also mark any point you find important enough for a re-visit. This fish finder can store up to five thousand waypoints which you can mark with different kinds of icons. The Striker 4 is a small device, so it's no wonder that it comes with a 3.5-inch display. The screen comes in a 480V x 320H resolution pixel matrix. It also features a backlight and HVGA color display. All of this means you'll be able to view readings even when working in direct sunlight. With this fish finder, you can see at most two applications or panels on this display at the same time. This unit is IPX7 waterproof which means water splashes or rain won't damage it. But, it can also work even after an immersion of 1 meter or 3 feet in freshwater. The Striker 4 doesn't come with NMEA connectors or an SD card reader. But, you can transfer waypoints with a data cable between any echoMAP device and this unit. It also comes with a power cord and a swivel/tilt mount.